“We are who we believe ourselves to be – not what someone thinks we should be.” It’s a safe bet that Patrick Victor, best-known of all Seychellois singers, would approve of these sentiments, expressed by fellow creole musician John Wout. Yet two oceans and a continent separate these kindred spirits, underlining the bond shared by creole cultures across the world, wherever they flourish. “We sort of misled ourselves into believing that Europeans visiting the Seychelles would enjoy and appreciate their own brand of musical entertainment more instead of our own traditional music, like sega”. “Tambour Moutia” evoked the rhythm of the moutia, a dance performed by 19th century slaves as a mark of contempt towards their white masters. Sentimental it was not, yet it was entirely true to Victor’s creole roots, and launched his cultural crusade on behalf of his people. Public recognition followed soon afterwards. An early reviewer commented: “Two young performers, Patrick Victor and David Filoé, have adapted the traditionalmoutia and ségadances in a modern setting.” This masterful piece of understatement was soon overtaken by the many highly favourable reviews that followed Victor’s flourishing career. In 1976, he won a song contest organised as part of the Seychelles Independence celebrations with his composition, “La Nou Pe Vin en Nasyon” (Now We are Becoming a Nation). Victor’s first album, “Kouler Lokal”, (Local Colours) followed in 1978 and featured 12 songs in a mixture of Creole, French and English. 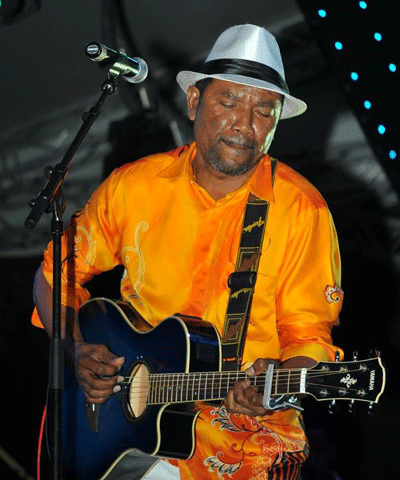 During the early years of independence, Patrick Victor became increasingly well-known as the voice of Seychellois Creole culture, solely through the medium of his music. For a nation whose language then had no standardised system of writing or spelling, finding an alternative medium through which to channel its national identity was essential. Victor filled the gap, enchanting and enthralling audiences wherever he sang. In 1977, the newly independent government of the islands, conscious of the need to establish the identity of its people, recognised Seychellois Creole as having equal status with English and French, the two other national languages. By 1981, Creole had become the first official language of the nation, now with a fully developed orthography. The following year, as part of the continuing official initiative to promote cultural values, Patrick Victor formed the National Cultural Troupe, bringing together the country’s most talented traditional dancers and musicians. This gave him an opportunity to spread his unique message to other Creole countries, and further afield. Having established a strong, almost evangelical following among the island nations of the Indian Ocean, Victor took the Troupe to Europe. They toured widely, performing in the capital cities of almost every major country, and delighted audiences everywhere with a fresh, vibrant form of entertainment that was free from the overtly commercial flavour of most contemporary music. The mystique of his uniquely creole message and his personal charisma won him thousands of new fans. Victor’s next artistic triumph was a masterful combination of creole values, historical significance and sheer entertainment. The stage musical “Kastor”, based on documented events of the 19th century, recounted the story of a runaway Seychellois slave leader. Captured after years of resistance to the colonial authorities, Kastor became a government agent and allegedly helped capture many of his fellow rebels. The 1980s were Patrick Victor’s heydays, during which he wrote and recorded many creole anthems, including “Koste Pep Losean Endyen” (People of the Indian Ocean, Unite), which foresaw the landmark event of the first International Creole Festival in 1985. The same year, with his group Bwa Gayak, he sang in Moscow alongside Joan Baez and other international stars in a concert against racism, and he enjoyed enduring popularity for the following decade. Wise words from a man whose contribution to the emergence of his people continues unabated. His most recent album, Frazil, was released in 2009, and he encourages other local artists through his personal involvement and the use of his BacktoBack recording studios at Bel Ombre. To accept change and exchange across generations and culture groups is the natural dynamic and greater tradition of life itself. Most observers agree that, in his lifetime, Patrick Victor and his music have achieved exactly that.